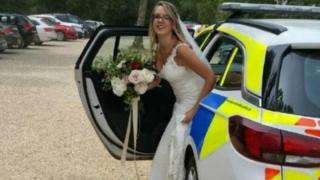 A bride was given a lift to her wedding in a police car after her wedding car broke down. The gift of "something borrowed and something blue" arrived in the shape of two Cirencester officers who came to the rescue and picked her up from home. PC Mark Weedon said: "When we first walked in to all the bridesmaids downstairs, we had the usual, 'are you strippers?' which we said we weren't." The driver was unable to contact the bride as the mobile signal was poor. The bridal car broke down in Crickley Hill, Birdlip, about 14 miles from the bride's home in Barnsley, near Cirencester, Gloucestershire. PC Weedon said: "The bride's mum came down and thought there was an issue with the cars parked outside, but once they realised we were police officers and not strippers and we were there because their's had broken down, the bride was cool as a cucumber. "She took it all in her stride, she had a smile on her face and she didn't seem fazed." PC Weedon and Sgt Andy Wood, stepped in to take the bridal party to Cripps Barn after being alerted about the situation from the local road policing unit which was dealing with the broken down car. He added: "When we turned up at the venue we put our blue lights and sirens on. "I think it sent everybody off into panic mode but when they saw everybody was waving and were ok, it was appreciated."